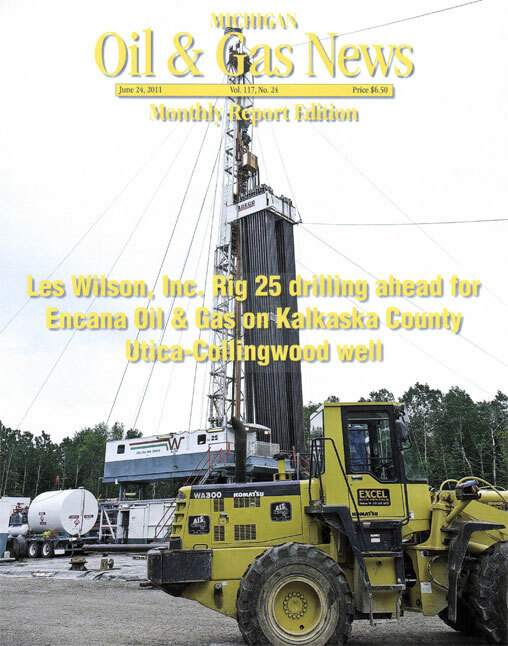 Encana Oil & Gas Completed Drilling - Les Wilson Inc.
KALKASKA COUNTY, Mich. – Encana Oil & Gas USA has reportedly completed drilling on its latest Collingwood-Utica prospect in Cheboygan County, the State Wilmot 1-21 (SL: SE NW SE, Sec 21T33N-R3W, Wilmot Twp., Cheboygan Co.) and continued to drill ahead with Les Wilson, Inc. Rig 25 at press time this week on its first Kalkaska County Collingwood-Utica well, the State Excelsior 1-24 (SL: NE SW NW, Sec 24-T27N-R6W, Excelsior Twp., Kalkaska Co.). The State Wilmot 1-21, which was permitted as a vertical hole to a target depth of 5,834 feet, was production cased upon reaching total depth, according to unconfirmed field reports. To date Encana has not received a drilling permit or change of well status approval to drill a horizontal drain hole from the State Wilmot 1-21. Encana has applied for a drilling permit for a horizontal redrill of the State Excelsior 1-24, with the permit application for the State Excelsior 1-13 HD1 indicating that Encana plans to drill a long horizontal drain hole from the well's surface location in the NW¼ of Section 24 to a targeted bottom hole location in the NW¼ of Section 13. The proposed measured depth to the targeted bottom hole location is 14,442 feet. Encana has been granted a Rule 303(2) spacing exception to form a 1,440-acre drilling unit for the State Excelsior 1-13 HD1 horizontal well, comprised of all of Section 13, the E½ of Section 14, the NE¼ of Section 23, and the N½ of Section 24.